At Right Lane we believe that ‘best practice’ is an evolving concept and that continually seeking new ideas to improve your strategic planning process will help you breathe life into your next strategy. We draw on our experience and learnings from hundreds of recent engagements, to present 10 ideas for your organisation’s next annual strategy development process. These ideas will help bring premeditation, anticipation and purposeful design to your next strategy and planning process. To avoid bias ridden planning processes, leadership teams should embrace divergent ‘strategic thinking’ as an essential component of the strategy and planning process. Strategic thinking should be challenging and can sometimes feel uncomfortable. Pushing through this ‘pain’ leads to far superior outcomes when developing strategic plans. In our experience, most organisations, and most executives, are dissatisfied with the strategic engagement of CEO+2 cohort (i.e. the direct reports to the CEO’s direct reports). 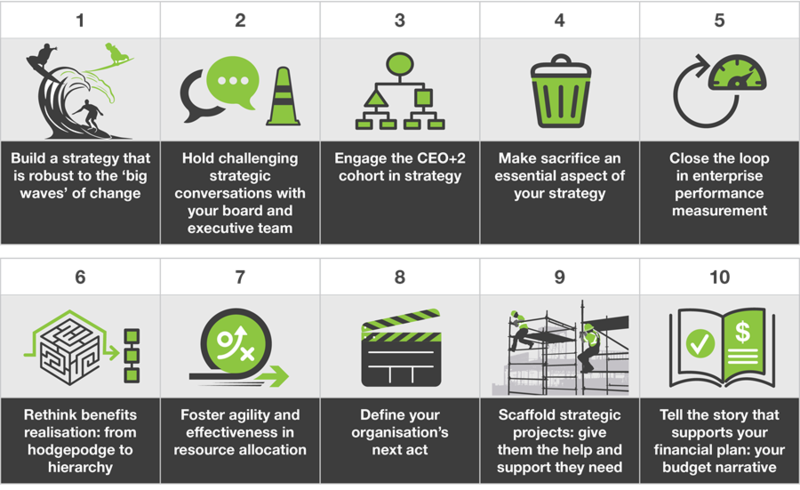 Engaging the CEO+2 cohort at the start of the strategy process can be particularly useful for idea generation and ensuring strategic alignment with the broader organisation. The heart of strategy is selecting from among the vast number of possible activities an organisation could pursue, a select few which strongly reinforce one another. This requires leaders to define not just what their organisation will do, but also what it won’t do, to ensure sharp focus on the things that matter. Issues arise when organisations don’t ‘close the loop’ in enterprise performance measurement. Closing the loop is simple: start with a small number of high-level strategic measures that matter most; cascade them systematically down the organisation; and most importantly put in place feedback loops that help continually iterate the framework. During the strategy development process, we’ve observed recurring challenges in the way organisations approach benefits realisation. We suggest that organisations adopt a benefits realisation hierarchy. We define agile resource management as the adaptive allocation of human and financial resources to dynamic priorities. This may require a shift in internal processes. Too often we see strategies with a long list of actions. The fear for potentially taking the wrong action grips, overtaking the fear of taking no action at all. To overcome this, we urge organisations to develop and embed internal processes to help define their best next steps. As projects are becoming the default way to get things done within organisations, enabling their success is more important than ever. We suggest six ideas for scaffolding projects, large and small. In our experience organisations often run strategy and budgeting processes in parallel, never intersecting. Interlinking these processes provides an opportunity to ‘put your money where your mouth is’. We hope that the ideas presented here have given you something new to think about for your next strategy and planning process. We would love the opportunity to discuss these ideas with you in more detail. Get in touch today.